A brand-new standalone feature film looking at the character of Venom might feel like a welcome injection of 90s nostalgia from a distance. But it actually comes away with the feel of the movies from the mid-2000s just before the Marvel Cinematic Universe shook the world. Venom ends up just falling short of those heights relegating it to the same type of feel as those early movies. It ends up looking like just a movie that happens to feature a Marvel character, one that makes you go "It's Venom!" Just like Daredevil!, Ghost Rider!, The Fantastic Four! Venom is a character constantly in danger of being an attitude looking for a personality, and when he was shoehorned into Sam Rami's Spider-Man 3, actor Topher Grace, managed to inject a little bit of pathos to the role. 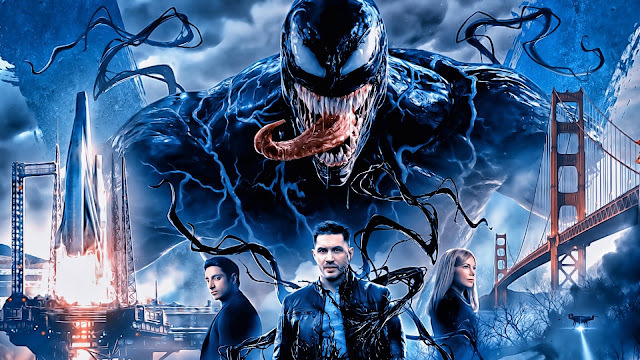 In this film, the alien goo still decides to take Eddie Brock as its host, played by Tom Hardy and sees the location moved to San Francisco where he hosts some kind of online news-show and canoodles with his girlfriend, Anne Weying, played by Michelle Williams. When a spaceship, owned by tech mogul, Carlton Drake, played by Riz Ahmed, crashes back to Earth carrying some alien symbiote samples, Brock investigates for a fluff-piece to give them some good P.R. Instead he nicks some information from Anne, whose firm happens to be working with Drake, and confronts him about it in his video-piece. But he lands both himself and Anne in hot-water. A few months later, a down-and-out Brock is phoned by a whistle-blower who wants to expose the unethical experiments Drake has been performing on human subjects. But things go very wrong and instead of getting his next hot-story, Brock ends up with an alien parasite. Of course, the introduction of the parasite is supposed to tease the darkness out of Brock but from the offset, it seems less ethically compromised than it does bright and Michelle Williams doesn't seem very sure on how she is going to play her paper-thin character. The movie also takes a little too long for Brock to become infected, probably because the script wasn't too sure what purpose Venom would serve apart from the big fights right at the end. To his credit though, Hardy seems determined to play this role to the best of his abilities, choosing to approach Eddie Brock as a Jekyll and Hyde parody. And Venom grumbles away in Eddie's head when his toothy face is hidden. Some of his lines are actually quite amusing! With Brock getting used to sharing his body, Venom seems to have plenty of fun in pulling us along in a multitude of action sequences. But the best moments come when the film dips its toes in some body-horror, something though that it never fully commits too, perhaps because some of its audience would be a little too young or perhaps because the director, Ruben Fliescher is more interested in the comic turns than the horror ones. That would have worked too had he pushed some of the movie's stranger moments, especially who else could host a symbiote a little further. We've got moments set in San-Francisco and Malaysia which are both creepy, almost running parallel together and comedic before they just become moving set-pieces. As a result, Venom downplays its comedy and horror moments and has moments where it resembles more of a Jason-Bourne thriller than a Marvel movie, it even has Ahmed barking orders from a control room! However, Venom is certainly watchable thanks to its silliness and performance from Hardy. And the grotesque CGI form of Venom isn't too different from its Spider-Man 3 counterpart but it delivers in its promise of bigger, more muscular and features a much bigger oversized tongue. But then not every good superhero movie needs to be styled after the MCU. Many of them are great but with a few coming out every once in a while, there is something to be said about not relying on the uniformed-treatment of the Marvel Universe we have nowadays. But that makes it all the more disappointing with Sony's latest not-Spider-Man movie. We've got side-characters who do absolutely nothing, Venom becomes a hero from his first moments on screen and a post credits scene that both excites and makes you fear for the next instalment. Carnage is a character I've longed to see on screen for some time but is the new Venom franchise the right time to see him? However, the film makers here seem to vaguely understand what a superhero is supposed to be about, but they seem to be unsure about who Venom actually is. Venom will never reach the heights of the MCU and instead settles for being a movie with another character in it. You'll end up going, "It's Venom!" What else do you want?